If you want to get away from snow and alpine walks, head to the West Coast for one of the best one-day walks. This all-weather trail follows an old coal railway line through the Ngakawau River gorge, and along the way, you’ll spot rustic relics, tunnels, and the Mangatini Falls. This one is a hot climb even in winter. The youngest—created 600 years ago—but the largest volcanic cone is easily reachable via a short ferry ride from Auckland city centre. The easy climb makes for a great day trek with well-formed paths through lava fields. If you’re keen to explore more, take a side trip to the Lava Caves or head to the Wilson Park Track. Pick a crisp winter morning, pack a lunch, and discover the mining history of Karangahake Gorge. You may have driven past it on your way to Thames or the Coromandel, but it is well worth a stop to explore the old walkways and tunnels. Choose from different walks and tracks that include the historic walkaway—a path that follows the old Paeroa to Waihi railway line—and the tunnel loop walk—along the Ohinemuri River and over the Waitawheta River. With many tracks and trails crisscrossing Great Barrier Island, there is a walk to suit everyone, depending on your fitness level and time availability. Discover the mountains on the 25km Aotea loop track that takes you deep into the forest and then upon mountaintops or take the shorter and easier track to Kaitoke Hot Springs for a warm soak after the walk. You may have tackled this multi-day trek over summer, but it’s another story during the colder months. 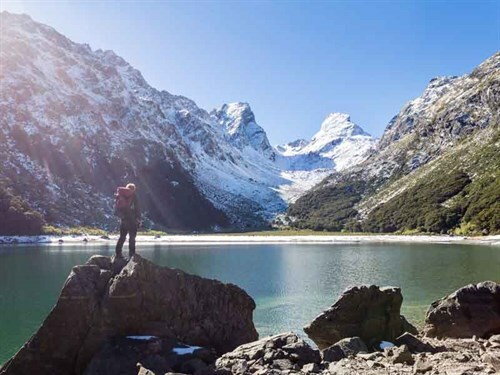 The 32km track in Fiordland National Park is not an easy outside the Great Walks season (24 October to 30 April), especially with seasonal restrictions, and should be tackled only if you’re an experienced tramper. But if you’re looking for something easier, there are some great day walks to explore to get a taste of the Routeburn track. From a track through forests to a loop that takes you Taranaki Falls, there are many options to choose from at Tongariro National Park. The one-day alpine crossing is a popular one but is a harder to tackle in winter, so it’s best to save this for a summer day unless you’re an experienced tramper. The 10km coastal walk between Stony Bay and Fletcher Bay is well worth the effort with spectacular views of Sugar Loaf Pinnacles and Great Barrier Island. It’s an easy walk albeit a long one (seven hours return) and you’ll spend a day to complete the return hike, or alternatively, you could arrange for shuttle transport. If you’re making your way up north—all the way to Cape Reinga—this 16km round-trip walk is worth checking out. It meanders through beaches, coastal forest, manuka scrubs, and over sand dunes and is mostly flat and easy-going, with options to either head to Werahi Beach or Twilight Beach. Note: If you’re looking at tackling alpine walks, make sure you carry winter essentials, good hiking boots, the right gear, and be sure to check the weather before you leave.